Guatemala's new president, Jimmy Morales said to his Costa Rican counterpart Luis Guillermo Solis that the Guatemalan government will work with the pilot of Costa Rica to resolve the crisis of Cuban migrants that the South American country is suffering, where still remain around 5500 Cubans since last January 6, trips from Costa Rica to El Salvador to pass through Mexico and reach the US began. 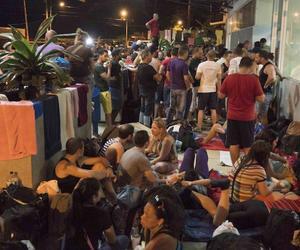 The previous president, Alejandro Maldonado, refused to allow the pass of Cuban immigrants through his country, declaring security risks and economic costs unaffordable by the Guatemalan administration. However, Maldonado ended up accepting after the request of Pope Francis to the governments of Central America to solve the humanitarian crisis of Cubans.